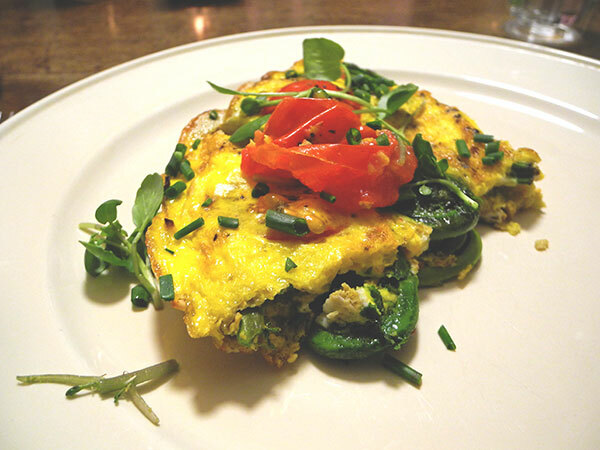 This was a slightly different version of a favorite recipe. I had already bought a tuna steak at the Greenmarket and was about to head home when I spotted what turned out to be the last young fennel bulb on a table at Bodhitree Farm. 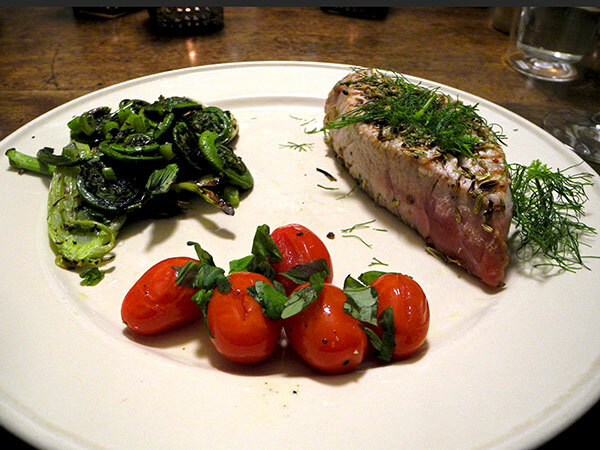 I usually ‘pave’ tuna steaks with crushed fennel seed and dried chiles, and I thought that this time I might find a way to serve it with fennel two ways. 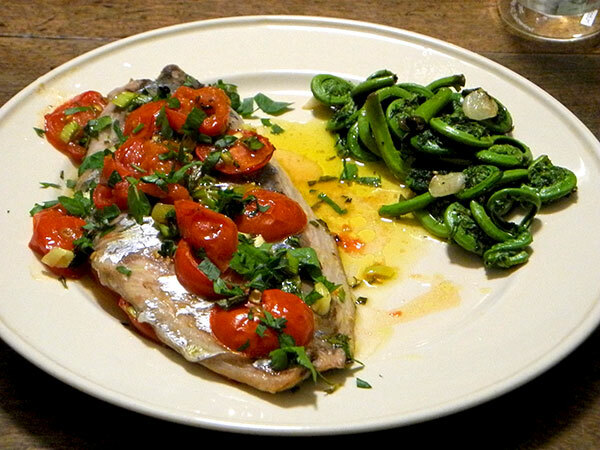 I hadn’t really brought home enough fiddleheads, and I wanted to use them as soon as possible, so most of the fresh fennel material went toward filling out the portion of green vegetable on the plate. After we had sat down and begun the meal I decided that the basic tuna recipe doesn’t really need any gilding, but the combination of young fennel bulb, fiddleheads, and spring garlic was pretty good, and subtly complex. 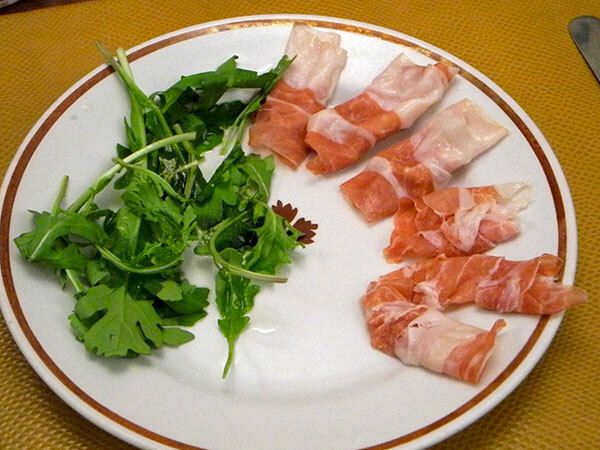 It’s a great summer meal, and although it’s a pasta dish, and technically a salad, it easily stars as an entrée, balanced before and after with an antipasto, also room-temperature, and a cheese or fruit course. It should serve at least 6 under those circumstances, but since it really is just as good as a leftover, and this time we were only 4 (and had seconds), the two of us were able to enjoy it again three days later. 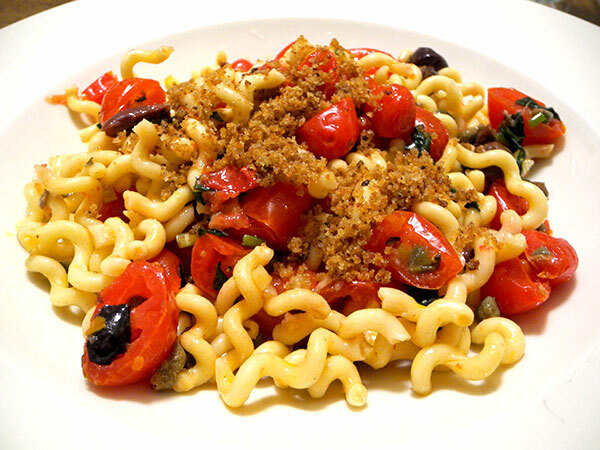 The dish is ‘Fusilli Mediterranei’, the recipe I use is included in Anna Tasca Lanza‘s treasure, ‘The Flavors of Sicily: Stories, Traditions, and Recipes for Warm-Weather Cooking’, one of my favorite Italian food sources. Tasca prescribes over two pounds of ripe tomatoes, peeled, seeded, and cubed, but the first time I used the recipe it wasn’t yet tomato season, so I substituted some excellent ripe grape tomatoes, halved each of them, and used a tiny spoon to press out the seeds and juice. It’s the way I prepare the dish each time. You should have a large bowl on hand, and allow about three hours time to prepare the dish. Only one hour involves actual work (mostly dealing with the tomatoes and pitting the olives); the remaining two are for letting the ingredients rest at room temperature at two points during the preparation. This supper was totally improvised. We arrived home fairly late from the Wagmag Benefit, and we both had to be up early the next day, so time was important. I had some fiddlehead ferns in the refrigerator, already rinsed, which had not been included in the meal the night before, plus seven eggs, all kinds of spring allium (allia, alliums? ), and a few little bitty green things which would help make a good picture. While I was still gathering the ingredients at the Greenmarket today, I began to think of this meal as something of a miniature model of the New England I love. The bluefish represents the Southeast coast (Rhode Island waters, for me), while the fiddleheads seem very much a treasure of the green north. 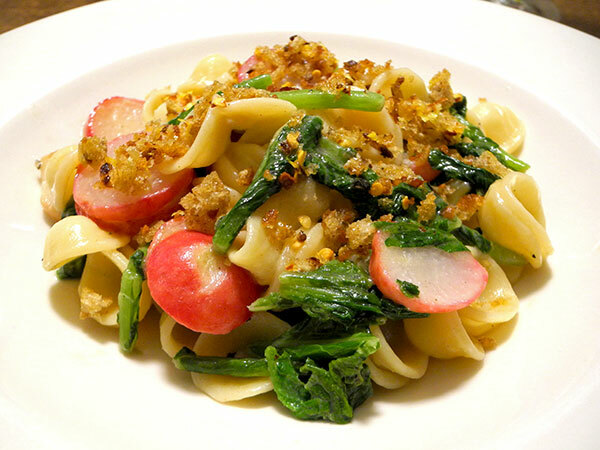 When I was starting out, I didn’t have much of an emotional investment in the success of this pretty simple meal, even though I was thinking of how much I loved cooking with both radishes and radish greens (not always as part of the same entrée), but, in the end, it was actually pretty terrific. The basic structure of the entrée was described in this ‘bon appétit’ recipe, although I took some liberties here, some out of personal preference, some prescribed by necessity, because of what I had available on hand.